Can the U.S. Eliminate Invasive Species by Eating Them? It seems like a simple proposition: American lakes, rivers and offshore waters are filling up with destructive fish and crustaceans originally from other parts of the world, many of them potential sources of food. So why not control these invasive populations by getting people to eat them? The idea has gained momentum recently from the lionfish, which invaded the Gulf of Mexico but was successfully marketed to restaurants and today appears to be in decline. People soon learned that beneath the lionfish's spiky skin lies a buttery, flaky meat that is perfect for ceviche, taco filler or as an alternative to lobster. After a few years of intense fishing and brisk fillet sales, the population is dropping. But businesses and scientists have struggled to repeat this apparent triumph with other species. Some, such as Asian carp, are not appetizing to Americans. Others, like feral hogs, reproduce too quickly to make a dent. And then there's the question of whether turning them into sought-after cuisine undermines the larger goal of eliminating them. "Eating invasive species is not a silver bullet," said Laura Huffman, the Nature Conservancy's director in Texas. But it can still be "a way to get people engaged in the topic and in the solution." Damage from invasive species extends beyond the environment. A Cornell University study concluded that they caused more than $120 billion in economic harm annually. Feral hogs cost Texas alone about $52 million in agricultural damage every year, according to a study by Texas A&M University. Asian carp were introduced to the United States about 30 years ago. Now they have infested dozens of waterways, including the Mississippi. The Army Corps of Engineers is weighing several options to try to keep the voracious eaters out of the Great Lakes, where they could threaten other marine life and the fishing industry. In China, the carp are a delicacy and even threatened in the Yangtze River. But they have attracted little interest among U.S. consumers, and the few Americans who make a living on carp export most of their catch. In Chicago, a group started to feed the fish to the homeless, an attempt to deal with hunger and help combat the invasive fish problem. A southern Illinois company had hoped to start packaging frozen Asian carp. And Kentucky organized a commercial fishing tournament to encourage anglers to go after them. But none of those efforts was enough to stir demand for the creatures. Another obstacle is concern that a successful carp industry could derail the original goal of getting rid of the fish. Feral hogs can also be tasty, but they reproduce so quickly that hunting doesn't make a dent in the population. Jean-Philippe Gaston, chef at Haven and Cove Restaurant in Houston, started serving lionfish because he wanted to help reduce its population in the Gulf. Now the taste alone keeps it on the menu. "It's light and airy and fluffy," said Gaston, who especially likes to use lionfish in ceviche and other raw-fish dishes because it blends well with spices and marinades. "People are scared of fishy fish. This one in particular is very mild, very easy going on the palette." But lionfish are hard to catch, and the dwindling population means Gaston and other restaurateurs have not been able to get any for weeks. For now, the fish are individually speared and can be sold for about $16 a pound, said David Johnson, founder and owner of Traditional Fisheries, one of the few U.S. lionfish suppliers. Yet Johnson said he can't keep up with demand, especially since many Mexican restaurants replace the crustacean with lionfish during lobster's offseason. 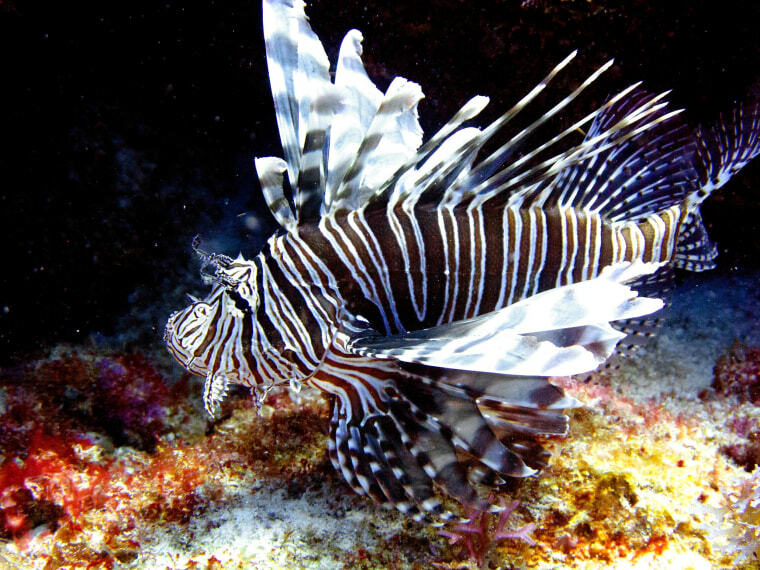 So Johnson, who lives in Wayzata, Minnesota, is designing a "smart trap" that would allow fishermen to catch lionfish en masse without netting other species. He hopes the traps will be in use by year's end. "Locally, we've proven that it does work," Johnson said of the effort to turn lionfish into a delectable dish. "In Cozumel, for example, we're having trouble finding lionfish because they've fished so many."